Fair or not, I think it's safe to say that Arab-American Hertitage Month has been and probably will be the hardest of these theme months to write for. Not because of a lack of commentary on the subject, but because, unfortunately, there are so few non-stereotypical representations of Arab-American masculinity and femininity in our culture that praising them kind of has to default to the basic, "Yay! They're not terrorists in this one!" critique that I would so love to get past. And yet, we kind of can't. The Arab-American = terrorist imagery is so strongly prevalent in our culture right now, cemented in the past fifteen years like the 1980s taught us that any Russian must be a blond bully, that it's genuinely pleasing to find a representation that dares to break ranks. There aren't many other stereotypes to subvert, frankly, meaning that in a weird way there isn't much to say. Then again, there's enough complexity in the world to fill the Library of Congress with single copies of printed works and still not have enough room, so I figure there's more to be said anyway. So far this month we've looked at three different ideas of what it means to be an Arab-American man in modern society (or the future). We looked at Abed's quest for assimilation and embrace of American pop culture in Community, then we shifted to examine Arab-excellence with Dr. Bashir in Star Trek: Deep Space Nine, before pivoting back around to look at the complex issues of race and mental illness with Elliot in Mr. Robot. It's been a good month so far, but there are still a few things left to discuss. It's time to tackle the big one in the room - let's look at how growing up Arab in a post-9/11 American can radically alter your future, even if said future involves becoming a semi-magical superhero. 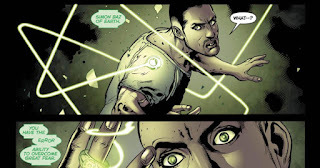 Let's talk Green Lantern, DC Comics' occasionally suspect storytelling choices, and Simon Baz. It's sort of a running joke at this point that whenever DC Comcis wants to add "diversity" to their lineup, they add another Green Lantern. Need a prominent black superhero to occasionally work with the Justice League? Make him a Green Lantern! Need a gay character? Green Lantern! Need to add in a narrative about a young Arab-American man so that you can compassionately and deeply deal with the troubling rise of anti-Arab sentiment in modern America? New Green Lantern! 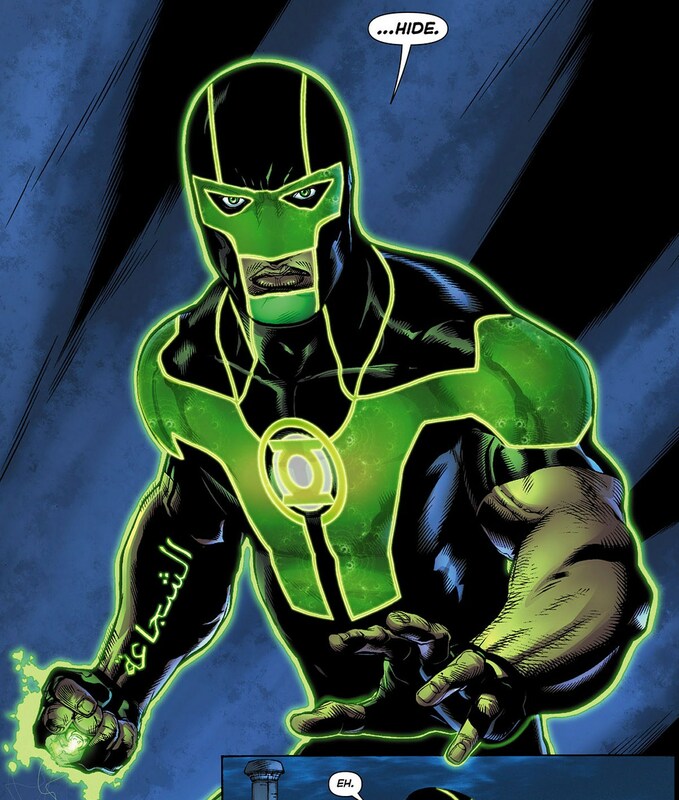 I'm mostly kidding about the decision process here, but for whatever reason, when DC Comics decided to add an Arab-American superhero to their roster in 2012 they chose to make him a member of the Green Lantern Corps. As we'll discuss in a minute, this was a little bit genius and a little bit dismissive at the same time. The story goes like this: Simon Baz is your average young American man growing up outside of Detroit in the worst possible conditions. He's Lebanese-American and when he's ten years old he and his family go through hell. They're targeted at school and on the streets for being Arab-American. They didn't have much before that and now they have even less. As he grows up, Simon Baz gets angry. The economic downturn of 2008, which hits Michigan harder than most, doesn't help. He turns to street racing and eventually car theft to survive. And then things get worse: Baz steals the wrong car, a large van that just so happens to have a bomb in the backseat. Terrified and desperately trying to make sure that no one gets hurt, Baz drives the car over to the factory where he used to work, a factory he knows must be abandoned now, so that it can go off without hurting anyone. Unfortunately, he gets caught and charged with terrorism. He's an Arab-American man with a grudge who just put a car bomb in the factory that laid him off. This doesn't look good. It's while Baz is being interrogated by the police that things get really weird. Sensing his presence out there, the Green Lantern fusion-ring belonging to both Hal Jordan and Sinestro* finds Baz and chooses him. It whisks him away and he starts his new life as a superhero, albeit a superhero with a warrant out for his arrest and one hell of a criminal record. He's the new guardian of Earth, even if the Justice League is less than thrilled with his existence. From there his story is pretty comic book standard. Your usual showdowns with the good guys, showdowns with the bad guys, accidentally falling into the wrong portal and ending up stranded in another dimension, healing loved ones with magic powers but not being able to stick around, etc. The normal stuff. 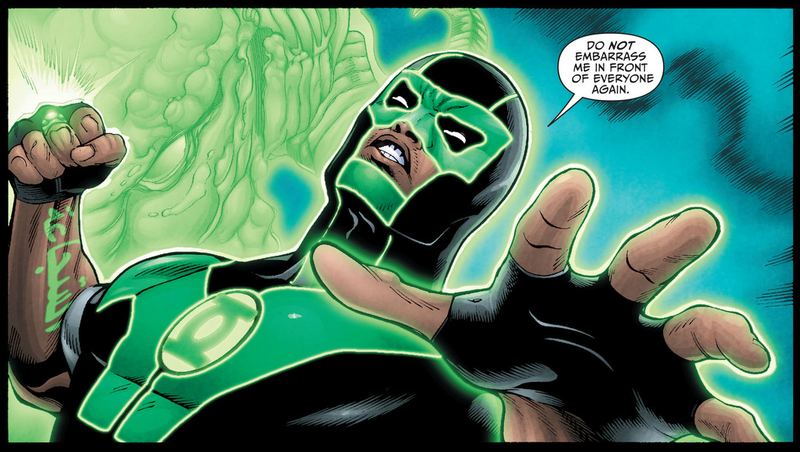 What's really interesting about Simon Baz is, sadly, not his tenure as a Green Lantern. The critics all pretty much agree that as a Green Lantern Baz is hampered by dull storylines and inconsistent characterization. It's not his fault, per se, but the initial excitement over his character has died down to a vague awareness that he still exists in the DC Universe. So, it's not great. Again, not Simon Baz's fault, but when we get down to it, a lot of his value and interest as a character is all about those first few pages of the first issue of his run on Green Lantern when we first got a taste of what it means to grow up Arab in America. And props to DC, they did not sugar coat it one bit. So there's a book that I tend to think everyone should read. How Does It Feel To Be a Problem? by Moustafa Bayoumi is the kind of book that grabs you by the shoulders and shakes you, even if you as a person tend to think of yourself as "woke". I'd put it up there with Between the World and Me in terms of real talk about race and beautiful writing, even if it's much less well known. It seems barely an exaggeration to say that Arab and Muslim Americans are constantly talked about but almost never heard from. The problem is not that they lack representation but that they have too many. And these are all abstractions...They appear as shadowy characters on terror television shows, have become objects of sociological inquiry, and get paraded around as puppets for public diplomacy...They are floating everywhere in the virtual landscape of the national imagination, as either villains of Islam or victims of Arab culture. Yet as in the postmodern world in which we live, sometimes when you are everywhere, you are really nowhere. That is Simon Baz's life in a nutshell. "Sometimes when you are everywhere, you are really nowhere." What I genuinely do appreciate about him is how honest and realistic his background really feels. I mean, you read that story and you think of how true it must be. It feels almost impossible that there isn't a young man out there with that exact same story, right? A lot of that comes from the character's creator: Geoff Johns, a DC mainstay, is half-Lebanese and hails from Michigan. As we could with Sam Esmail and Elliot Alderson in Mr. Robot, we can infer from this some level of connection between Johns and Baz. But it also goes deeper. Simon Baz's experience growing up and coming of age in such a difficult time is a story that really demands to be told. His is the hidden story of our country right now, the hidden cost. 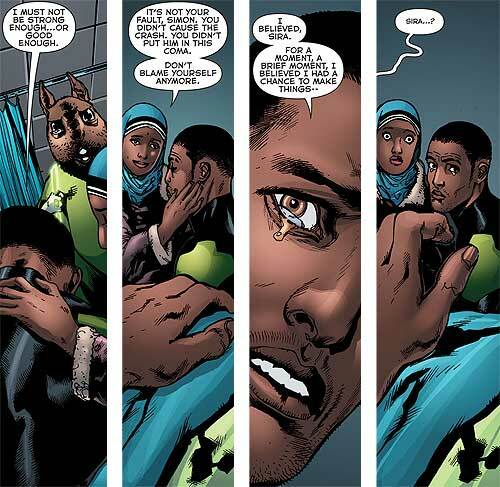 In a weird way, Simon Baz, with his constant awareness of his race and his staunchly Muslim and Middle-Eastern background and his eventual fate as a presumed terrorist, is a completion of the other narratives we've looked at. It's like there are only a handful of ways the media is comfortable portraying an Arab-American man. Either he can deny his race and assimilate completely, like Abed in Community and to a lesser extent Elliot in Mr. Robot, or he can magically be transported to a post-racial society like Bashir on Deep Space Nine, or he can tough it out and face down the racists and the xenophobes and the crippling poverty and the complete lack of options like Simon Baz does. Clunky and obvious and inconsistently written as it is, this comic gets all the credit for that. In those few pages at least, we get an unflinching view of what it means to grow up in a society that hates you. To be told day after day that you don't belong, that the world would be better if you weren't in it, and that everything you love is wrong. For all its meh-ness later on, this comic gets all the props in the world for openly admitting that Simon Baz is in so many ways formed by his experiences and his experiences have not been good. He steals cars because he was laid off. He was laid off because the factory was closing. The factory was closing because of the financial crisis. He couldn't get a better job because his family couldn't afford for him to go to college. They couldn't afford for him to go to college because of medical bills and because his parents couldn't get high-paying jobs. He has anger problems because he's been targeted by racists and bullies since he was a child. He's a suspected terrorist because of the color of his skin and the level of his income. Simon Baz is systemic inequality writ large. And none of that magically goes away when he becomes a superhero. That's probably the most interesting part. He doesn't magically become a super awesome guy. Those fifteen years of being called the bad guy have left scars. He's hotheaded and makes mistakes and really doesn't trust the Justice League who don't trust him right back (at first, at least). It's not immediately magically okay. But there's still a silver lining, which is what the comic seems to say. In the end, Simon Baz is a superhero precisely because he has faced all of this. See, the Green Lantern Corps is all about facing down fear. It's about being fearless. You could argue that Simon Baz shouldn't qualify because he's, well, not fearless. What the comic points out is that by living in our society, by getting up every day and choosing to face the anti-Arab sentiment head on, by refusing to claim he's Latino or Central Asian or anything else to get out of the situation, Simon Baz is being fearless. He is refusing to let fear run his life, and that makes him a damn hero. *Green Lantern is not my jam. I prefer comics with lady superheroes or Clint Barton on the cover, for the most part. Ensemble comics about ladies who solve mysteries, investigate the paranormal, fly through space, fight orcs, or go to princess school also count. Basically I read comics about ladies. And Clint Barton.